We are super thrilled to let you know that last week, Intuit announced shopVOX as the winner of the 2017 $100,000 Small Business App Showdown! The Small Business App Showdown kicked off in August where over 100 amazing apps entered to win $100,000. Each app that entered this contest was featured in an online gallery that was promoted to the more than 2.38 million QuickBooks Online users worldwide. More than 50,000 people voted to narrow these hundred down to 10 finalists. 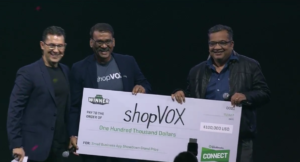 These 10 finalists, including ShopVOX, competed live on stage, in front of a panel of judges, at QuickBooks Connect on November 15th. Rao, one of shopVOX’s co-founders presented the three minute pitch that impressed the judges to choose shopVOX as the winner of $100,000. We had to wait until the next morning to know if shopVOX won or not. You can imagine our nervousness and hopefulness creating butterflies in our stomachs. 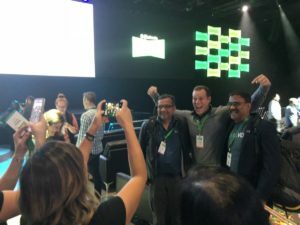 The next morning, Sasan Goodarzi, the Executive Vice President of Intuit QuickBooks announced shopVOX as the winner of the App Showdown. You can join in on our excitement and watch the live announcement on our Facebook page. You can also visit our Facebook page to watch the pitch that clinched shopVOX as winner. What does the win mean for shopVOX? 1. It boosts our confidence and offers confirmation that what we are doing is in the right direction. 2. It boosts the morale of the whole staff here and thereby they will be helping customers with renewed energy as they are part of a winning team. 3. We have closer ties with QB to resolve any issues we find in integration. 4. The money will help us invest back into the product by hiring more support and development help, thereby making the product better for end customers. ShopVOX allows custom shops to manage every area of their business starting with sales leads, ending with invoicing and everything in between, including management of pricing, workflow, projects, staff, customers, vendors, inventory and equipment. ShopVOX also offers custom businesses to send quotes and proofs online where they can track each on while the customer can approve or make changes online. If you are a QuickBooks user, you can install shopVOX from the QuickBooks App Store or sign up here.